The Volunteer Council met in Seattle, November 8-11, where the Seattle Symphony will host the League of American Orchestras 2014 National Conference: Critical Questions, Countless Solutions. The Council is already planning a volunteer track with award winning volunteer project presentations and incredible networking opportunities. I know each of you will want to budget now to attend the Conference, June 4-6. Another great opportunity available to delegates, in conjunction with Conference, is a week-long Alaska cruise on Holland America’s ms Westerdam, departing Seattle on June 7 (see additional information below). Make your plans now! This year’s Strategic Conversation conference calls were attended by nine presidents/president-elects from across the United States. These six one-hour sessions covered topics such as membership, fundraising, and leadership. It also gave participants the opportunity to connect with other volunteer leaders facing similar challenges and questions, and share new ideas and perspectives. These conversations will be held again next fall and I hope many president-elects will consider being a part of this valuable experience. Thank you again for your support of last year’s Volunteer Council 50th Anniversary appeal. This tremendous effort exceeded all expectations and put a spotlight on the extraordinary commitment of orchestra volunteers to each other, their home orchestras and the League. It has been wonderful to see the basic tenets of leadership, service, connection, and commitment that form the foundation of robust volunteerism in the orchestral field. I would also like to invite you to participate in a special opportunity to share your unique volunteer-staff collaborative fundraising efforts described in the article which follows. The Volunteer Council looks forward to meeting each of you at Conference, and hearing how you work to fulfill the mission and tackle the challenges facing your orchestra. We are available to support your volunteer association in any way we can. There is a saying by Michael Jordan, “Some people want it to happen, some wish it to happen, others make it happen.” You, the volunteer, make it happen. Thank you for promoting and supporting the mission of symphony orchestras. Do you have a successful project that benefited from the collaboration of volunteers and your development staff? Please share it with us! VOLUNTEER NOTES: Mike, you attended your first League of American Orchestras Conference last year. Why would you recommend it to others? MIKE MINOR: The Volunteer Council activities at Conference present a unique opportunity for you to meet volunteers supporting orchestras of all sizes. At the Conference you will have the opportunity to attend enlightening seminars, network, and share ideas with volunteers from other orchestras, and return to your orchestra with valuable information to support your volunteer organization. Whether you are in search of an innovative idea for a new fundraising project, need information on how to engage the next generation of volunteers, or simply want to share your experiences with volunteers from other orchestras, Conference is a great opportunity for you. VN: What was a highlight of the Conference for you? MM: A highlight of the Conference was the presentation of the Gold Book Awards of Excellence. These awards are given each year for outstanding projects submitted to the League of American Orchestras' Gold Book Online. Members from the organizations for each of the award-winning projects were on hand to discuss their projects and share their best practices with you. VN: Any last words you’d like to share with our readers? MM: Start making your plans now to attend the League of American Orchestras Conference in Seattle, June 4-6, 2014. Attending a conference is also a great way to build enthusiasm among your volunteer organization membership. I am hopeful to see you and other members of your volunteer organization for the Volunteer Council's sessions, seminars, and events next June. EDITOR’S NOTE: Conference registration will open at the end of February. Watch for special group pricing for attendees from a single orchestra. In addition to the Awards of Excellence presentations, there will be project presentations in RoundTable format, concerts, dinners with other attendees, and a wide variety of engaging sessions on topics of interest to all. $1,200 flat rate registration fee for three or more volunteer and/or board member delegates from a single orchestra. To secure this rate you must register your group of three or more by the April 25th early registration deadline, by calling member services at 212 262 5161. This offer is only valid for the 2014 National Conference, June 4-6, in Seattle. Innovation, volunteer involvement, return on investment and impact are the primary criteria the Volunteer Council utilizes to evaluate volunteer projects submitted each year to the League’s volunteer project website, goldbookonline.org. The Council had a record number of outstanding award winners this year. Thirteen projects from ten states will be recognized as winners of the Gold Book Awards of Excellence and presented at Conference this June. Dayton Philharmonic Volunteer Association (OH): Designers’ Showhouse and Gardens, a fundraiser that capitalized on the history of a historic home and gardens, and on the estate’s link to the orchestra’s performing arts center to draw record crowds and revenues. Houston Symphony League (TX): Maestro’s Wine Dinner and Collector’s Auction, a fundraiser that provided a salute to the orchestra’s maestro and his passion for food, wine, and music. Huntsville Symphony Orchestra Guild (AL): Silver Tea, a fundraising project that showcased talented young musicians at a beautiful traditional tea in a historic 18th century home. Indianapolis Symphony Orchestra Association (IN): Music is Magic Symphony Ball, a fundraiser whose magic show astounded the crowd, and whose live auction generated magical profits. Los Angeles Philharmonic Affiliates at Large (CA): Music Appreciation Classes, a community engagement project that sparked interest in classical music and in concert attendance. Milwaukee Symphony Orchestra League (WI): Holiday House, a “mini” showhouse fundraiser centered around the holidays. Oklahoma City Orchestra League (OK): The Trio in the Abbey Showhouse, an annual fundraiser that this year tripled the number of houses featured, yet kept the same number of volunteers. Richmond Symphony Orchestra League (VA): Symphony Designer House, a perennial favorite fundraiser that added new twists and was its most successful ball ever. Symphony Guild of Charlotte (NC): Engaging Membership Meetings, a membership project developed to spark volunteer participation and leadership development. Symphony Guild of Charlotte (NC): Virtual Office, a leadership/organization structure project that slashed expenses, and used the cost savings for educational projects. Symphony League of Kansas City (MO): Fountains of Music Symphony Ball, a fundraiser that drew from the city’s 200+ fountains for its theme and drew a flood of in-kind donations and sponsorships. Women’s Symphony League of Tyler (TX): Board Retreat, a leadership/organizational structure project that tapped a prominent national consultant to facilitate training and discussion. Women’s Symphony League of Tyler (TX): Sips for Scholarship, a unique fundraiser that parlayed simple donations of dimes and quarters into two youth music scholarships. In addition, a special Gold Book Classics Award will be presented to the Peoria Symphony Guild for its Puppet Troupe. Over the past 45 years, Guild volunteers have presented staged puppet productions to more than 618,000 school children in more than 60 schools in Peoria, IL, and surrounding areas. The Puppet Troupe will be featured at our Networking Lunch at Conference. You won’t want to miss learning about these award-winning projects. 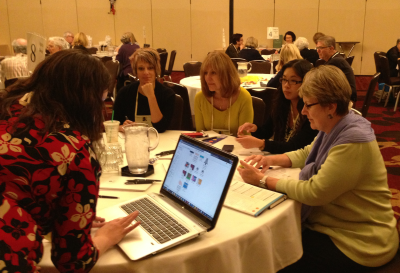 Join us at Conference and take home great ideas to share with your volunteer association! To search the Gold Book Online for all projects submitted since 2006, go to goldbookonline.org. You are sure to find projects that you will want to adopt or adapt. Having worked with affiliate volunteer associations for almost 50 years, beginning with the Syracuse Symphony Orchestra’s Women’s Association in the mid 1960s, I have seen a lot, and perhaps that qualifies me to emulate David Letterman and come up with my own top ten list of thoughts for truly effective volunteer organizations. The difference is that my list is not done tongue in cheek. 1) Your volunteer association is a part of a larger organizational structure. Even if your group is a separate 501c3, it is almost certainly registered as a support organization. What this means is that governing decisions are appropriately the responsibility of the board of trustees of the orchestra. Certainly the leadership of volunteer groups should be a part of that governing process, with ex officio membership on both the board and executive committee of the orchestra (ex officio does not mean non-voting). However, when volunteer groups attempt to direct spending priorities, beyond participating in discussions in the orchestra’s boardroom, the governance process itself is weakened. When an orchestra’s board has determined to cut a particular program, even a much-loved educational program, a volunteer association’s attempt to reverse it by essentially saying “you may only use our funds to support that program” is, in fact, a usurpation of the governance role. 2) I have had many experiences, while visiting orchestras, where I learned that the volunteer group and the orchestra management or board were not in alignment on the subject of mission and roles. It is critical for there to be an institution-wide consensus on the mission of the volunteer organization(s) and their relationship with the orchestral institution and its mission. 3) Take advantage of the good national models available through the Volunteer Council of the League of American Orchestras and through the League itself, for exploring the issue of mission and organizational relationships, as well as for a good overview of successful projects done throughout the country. 4) Assess projects and programs, and assess them honestly. If the principal purpose of a particular project was revenue, did it meet its goal? Was the goal a rational one? If the principal goal was not revenue, what was it? If it was “friend-raising,” did it really raise new friends, or merely entertain old ones? Projects that require a considerable amount of human resource and result in a net income of $5,000 may not be worth the investment of human resource. You might think it is stating the obvious that the important number is the net revenue, not the gross, but I have over the years seen organizations congratulate themselves over a high gross total while glossing over the fact that the actual net was minimal. 6) This one is really hard, but important. Do not continue individual volunteers in roles that they are clearly not performing well. I understand the human value of being kind and supportive, particularly to someone who is volunteering her or his time, and I understand the difficulty of asking a volunteer to step down from a role. However, I also understand the damage done to everyone, including the organization, by a job done badly over and over again. 7) Maintain healthy, constructive communication between the volunteer organization and the orchestra’s management and board. If there are issues of concern, they should be raised early, and in a constructive way, before they build into serious frustration. I frequently encounter an “us-and-them” mentality – often fostered by both management and volunteers. But it is never healthy. Cooperation, communication, and coordination are three very valuable C’s. 8) Then there is the other all-important C-word: Credit. No one can deny the importance of appropriate credit and expressions of gratitude for good volunteer work. After all, the management staff has been monetarily compensated for its work. Credit and gratitude are the units of compensation for volunteers, and it is incumbent on the management and board to always remember this. But it is also important for volunteers to be willing to share credit on projects that involve more than one volunteer group (or even those that involve volunteers and staff). 9) Acknowledge the importance of benchmarking and measuring results. Before a project is undertaken, establish realistic goals and outcomes. Use metrics from like organizations across the country in setting these goals. And, when it is over, assess the effectiveness of the project. If the project did not come close to achieving its goals, an honest assessment of why it didn’t will likely lead to success next time. 10) Have fun. Create an atmosphere where fun is valued. The work accomplished by volunteers in American non-profits, including symphony orchestras, is truly astonishing. It is fair to say that our orchestras would not be what they are without the dedication, passion, and hard work of volunteers. That being said, there is no reason why the work cannot be fun. I have seen far too many situations involving volunteer groups where the operative descriptive words would be “tension,” “drama,” “negative energy,” etc. People choosing to work for a cause in which they believe without monetary compensation seem to me to deserve to be able to find genuine pleasure in the experience. EDITOR’S NOTE: Henry Fogel, dean and professor of the arts, Roosevelt University's Chicago College of Performing Arts, is a much sought-after consultant to orchestras around the country. He was president of the League of American Orchestras (2003-2008) and president of the Chicago Symphony Association for 18 years beginning in 1985. We are very pleased that he was able to take time to share some of his orchestral wisdom with us. 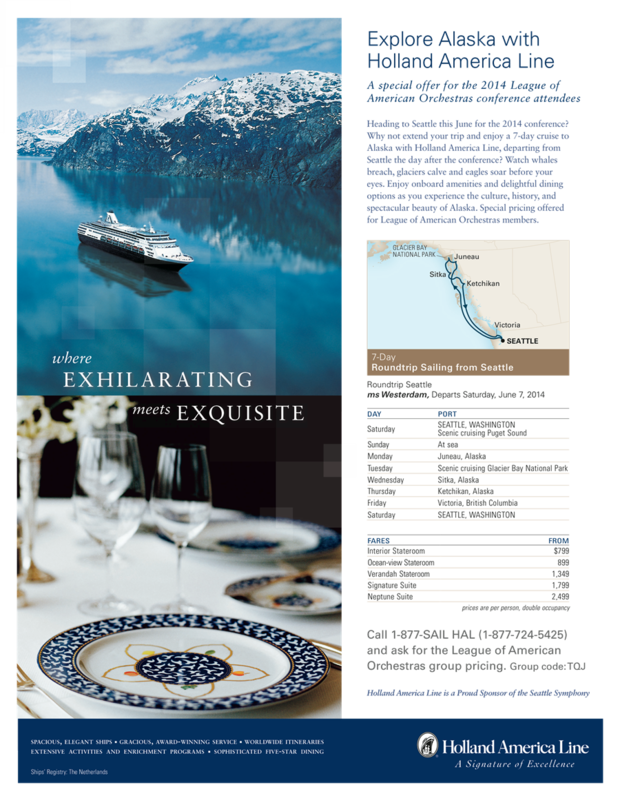 If you are planning to attend the League Conference in Seattle, Holland America Line and the Seattle Symphony invite you to extend your visit and embark on a round trip cruise to Alaska, June 7–14, 2014, following Conference. Special group fares have been arranged and opportunities to meet other League members and their guests are being planned. Special group pricing on a variety of rooms. Many include ocean views and verandahs. Make a deposit early for the best selection of rooms. Package includes 7 nights in a Stateroom or Suite, delightful dining options, and onboard amenities on the ms Westerdam, one of Holland America’s newest mid-sized ships. Watch the sun set over the Olympic Mountains while cruising the beautiful Puget Sound, after a 4:00pm departure from Seattle on June 7. Dine with League group members by selecting the early dining option at 5:45 in the Main Dining Room. Itinerary includes cruising scenic Glacier Bay National Park and visiting Alaskan ports at Juneau, Sitka, Ketchikan and Victoria, BC (passport required). Please note that there are a limited number of rooms allocated for the League group, so book early to get your choice of staterooms or suites. The group room allocations will be released March 7, 2014, and revert to published pricing at that time. The deposit will vary by room size, but is required within 48 hours of booking. Final payment is due March 24, 2014. Gratuity (approximately $12/day/guest) and tax additional.